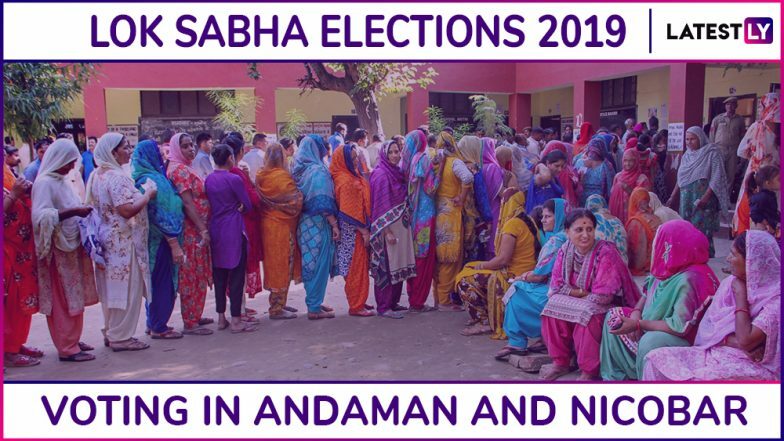 Port Blair, April 11: Voting for the first phase of Lok Sabha Elections 2019 for the constituency of Andaman and Nicobar Islands began at 7 am and has concluded at 5 pm on Thursday. About 70.67 per cent voter turnout was recorded till 5 pm. The Lieutenant Governor of Andaman and Nicobar Islands Admiral D K Joshi(Retired) also cast his vote at Polling Station No. 186, JNRM College, Port Blair in South Andaman. The counting of votes will take place on May 23 and results will be declared on the same day. A total of 15 candidates are in fray for the only Lok Sabha seat. The entire Union Territory is represented under the Andaman and Nicobar Parliamentary constituency. It has two islands Andaman and Nicobar which are situated at the intersection of Bay of Bengal in the Andaman Sea. According to reports, there are a total of 406 polling stations in the constituency and security is elaborate at all the polling booths. Andaman And Nicobar Lok Sabha Constituency in Andaman And Nicobar Islands: Candidates, Current MP, Polling Date And Election Results 2019. Lieutenant Governor of Andaman and Nicobar Islands Admiral D K Joshi(Retired) After Voting. The main contest for the Lok Sabha seat is between Congress and BJP. Congress has fielded Kuldeep Rai Sharma as its candidate and BJP has given ticket to Vishal Jolly for contesting as its candidate for the Lok Sabha seat. Apart from Congress and BJP, AAP and BSP are also in the race for Andaman and Nicobar seat for Lok Sabha Elections 2019. Sanjay Meshack is contesting on AAP ticket and BSP has fielded Prakash Minj. Mamata Banerjee's All India Trinamool Congress has also fielded its contestant, C.G. Saji Kumar. Also, ten independent candidates are vying for the Lok Sabha seat. Andaman and Nicobar seat has been dominated by the Congress for most part of the last 42 years. The party has represented the Lok Sabha seat eight times out of ten Lok Sabha Elections, since the year 1977. Bishnu Pada Ray of BJP represents the Andaman and Nicobar constituency in the Parliament from 2009. Until 1967, the Member of Parliament representing the constituency of Andaman and Nicobar was directly appointed by the President of India.